I stepped off the treadmill for a few days, and had a ball. Ireland has so much to offer, and you don’t have to spend a fortune to enjoy it. 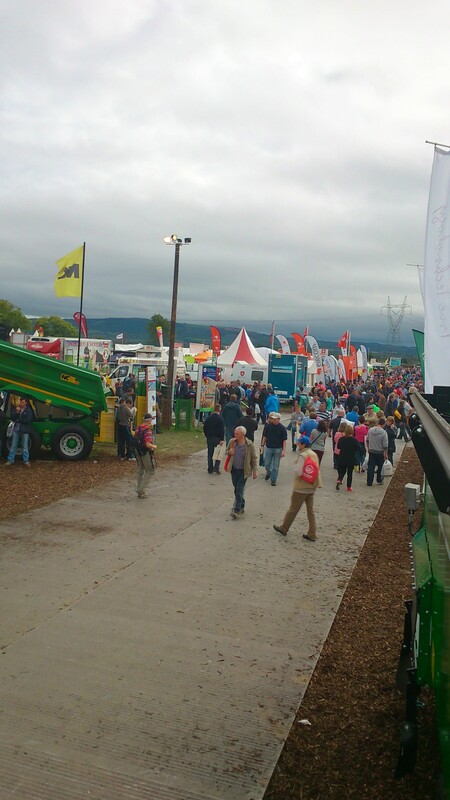 Every year I try to make it to the biggest event in rural Ireland’s calendar – the National Ploughing Championships. Urbanites and sceptics listen up: this is an event for everyone! Where else are you likely to see grown men and women, complete with coats, bags and boots, grab a partner and dance to live music at 11 in the morning? There’s fashion shows, cookery exhibitions, crafts and artisan food, alongside every possible agricultural necessity, all expertly laid out on 800 acres of walkways. And that’s all in addition to the ploughing itself. Is it going too far to say it’s the highlight of my year? I don’t think so – I just love it! Not a great picture, but you can get some idea of the 80,000+ people who visit the show daily. By the time you’ve walked all 800 acres, maybe more than once, and reached your car, you’re more than ready for that traditional Irish ‘tea and sandwiches’ before setting off on the road. This year, we stayed over in Tullamore, and I’m delighted we did. Next day, we went exploring one of Ireland’s hidden treasures: the somewhat eccentric Charleville Castle, just outside Tullamore. 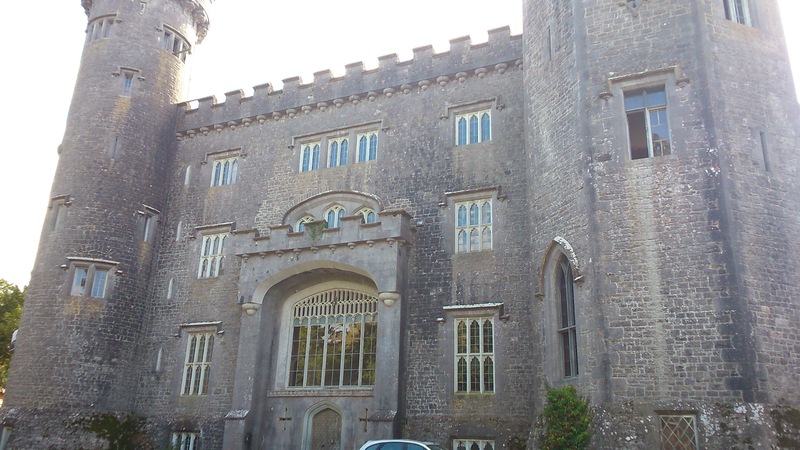 This year Charleville Castle celebrates its 200th birthday – still young, in terms of castles! After the guided tour, complete with details of the castle’s colourful past, and current ghosts, we headed for home. 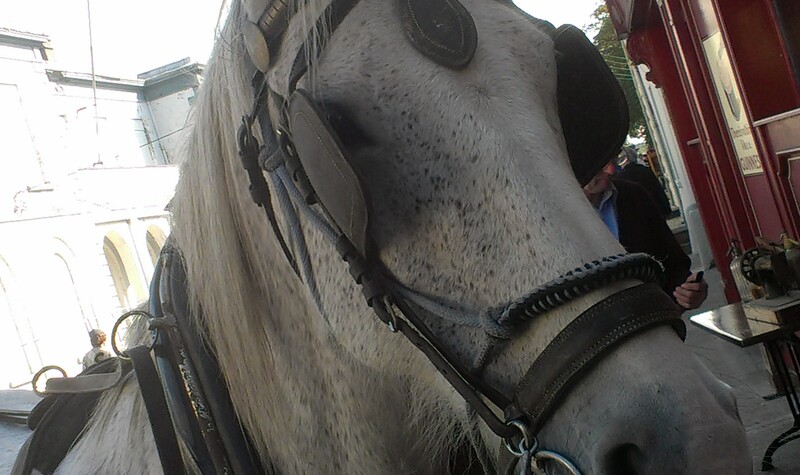 Next day was busy, with Castleblayney’s 2nd Annual Fair Day underway. A fantastic event, the town steps back in time, with shopkeepers and visitors alike arriving in traditional dress, and memories from yesteryear taking centre stage. Horses, goats, sheep, cattle and donkeys share the street with traditional crafts, vintage vehicles, old shop records, and street traders. It’s a sight for sore eyes. 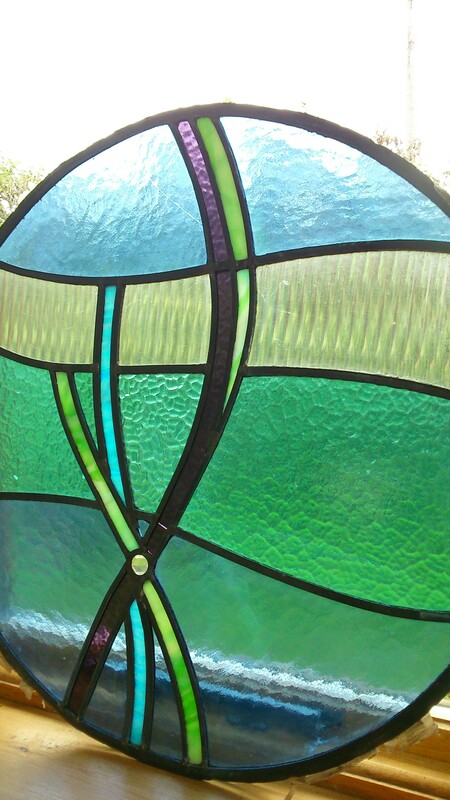 One of a pair of stained glass window panels. Irresistible to me, naturally enough! The day ended with an 18th birthday party, which went on well into Sunday morning! Any wonder it took me a while to get back onto that treadmill on Monday morning?! The occasional, meandering thoughts of an Irish fused glass artist, high in the hills of Co Monaghan, Ireland.